So what is a “good night’s sleep? Tom Rath, New York Times bestselling author of Eat, Move, and Sleep references a human performance study completed by K. Anders Ericsson who found that peak performance occurs in those who slept 8 hours and 36 minutes. The average American, in comparison, gets just 6 hours and 51 minutes of sleep on weeknights. Since we know that the typical caregiver spends a large part of their day and night in the care of their loved one, we certainly have to assume that they often don’t receive the 6 hours and 51 minutes of the average American and are commonly NOT functioning at their peak performance. 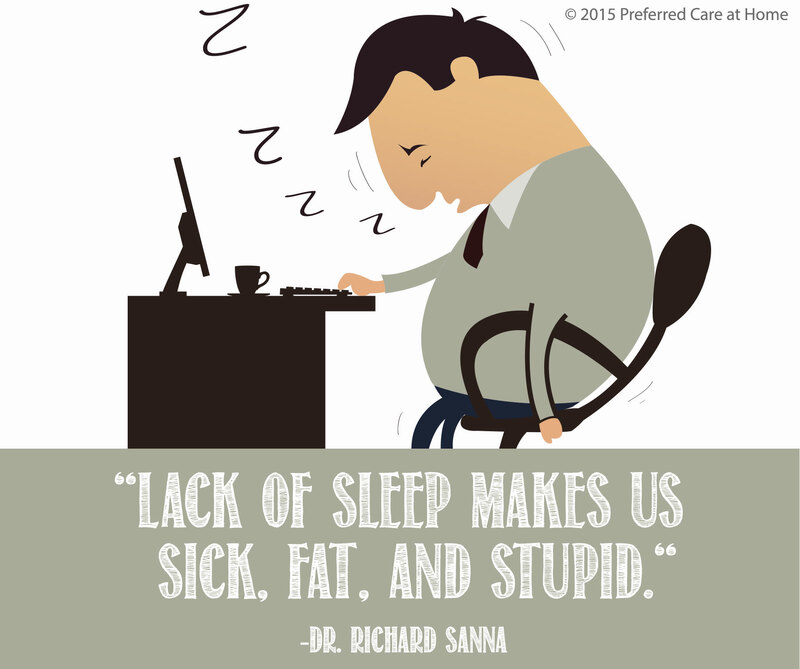 Sleep deprivation makes us sick. Poor quality sleep reduces the effectiveness of the immune system and due to a weakened immune system, can even accelerate the growth of cancer. Lack of sleep can heighten depression, and be a negative factor in people with diabetes and hypertension. The use of stimulants such as caffeine can produce hours of induced alertness but at a cost to our health. Sleep deprivation makes us fat. Sleep deprivation bring hormonal and metabolic changes that can lead to weight gain. Those who have a lack of sleep typically don’t exercise which compounds the weight gain problem and creates a vicious cycle. Eating quick , unhealthy meals may introduce problems such as digestive problems, acid reflux, and even an irritable bowel. Sleep deprivation makes us stupid. Under the influence of stress and sleeplessness, business and personal decisions can be made which are regrettable. Traffic accidents and even fatalities have been attributed to “falling asleep at the wheel”. Business and personal productivity, even our efficiency in care giving can be greatly reduced while functioning under reduced hours of sleep. When we become truly serious about obtaining the optimal hours of sleep needed to function at peak performance, we will seek for solutions! Strive to go to bed and get up at the same time each day. These recommendations are but a few ideas to help you improve your health and get serious about sleep. In the world of care giving, which often comes with long hours of taxing physical and emotional effort, it is vital to function at peak performance. If you have read my blogs, you have certainly heard me say this before, if you find yourself tired, becoming stressed, depressed or overwhelmed, seek help from outside sources prior to being at the breaking point! Recognize these symptoms as warning signs, not as defeat. Allow yourself to take a needed break, and focus on getting serious about your sleep!